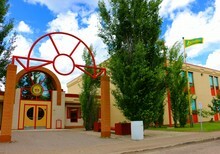 Glendon School is located northeast of Edmonton and is part of Northern Lights Public Schools. Students from preschool to grade twelve learn together in one building and we strive to be a Triple-A school, with excellence in Academics, Arts, and Athletics. Stop by some time and ask for a tour; we'd be proud to show you where we study and work every day. At Glendon School, we believe that learning is lifelong. The staff at Glendon School take pride in their hard work and continually undertake professional development to improve and to gain new knowledge. We also believe that success is a joint effort. From our students we need excellent attendance, a good effort in your studies, common courtesy, and respect for property, peers and staff members. From our parents and guardians we need regular communication and continued support for our efforts; keep in touch with the school and your children! With everyone working together, Glendon School will continue to be a very special, exciting place where the success of all students will be valued. We hope the content of this website will help you in learning and understanding the expectations and policies of the school. Please feel free to contact teachers or administration about your child or any other school-related topics. Our school website is an invaluable source of real-time information that you will find useful throughout the year. We look forward to working with you for the 2017-2018 school year!